Thank you for looking at our site and for your interest in our puppies. If I may, I'd like to take a moment of your time to explain our puppy process. We’re certain your new puppy will be very intelligent, it will enjoy learning and it will aim to please you. 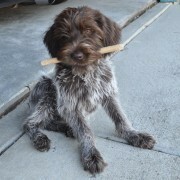 Your pup's genetics will give it a strong desire to run, fetch, swim, point, search and track. We want to keep these genetics within the breed and therefore only place our puppies into hunting homes. We take pride in our puppies and want to be sure both the new owners and puppies have happy homes. Before we accept a deposit, or place someone on our reservation list, we would like to discuss your expectations in a puppy and the environment you will raise your puppy in. No offence intended here, but we want happy new owners and happy puppies. The reservation list will be based on the order deposits are received. 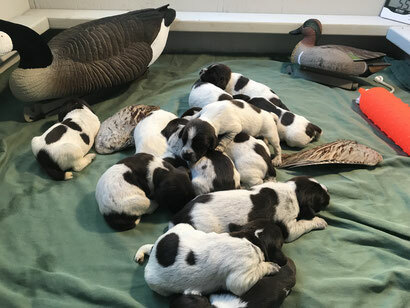 When pups arrive we will work with each person on the list to carefully match your new puppy to your style of hunting, home environment and what your family desires in a puppy and dog. We will assess all the puppies' personalities and at six to seven weeks of age we will choose the pup that best fits you and your family. Once again our goal is to have happy puppies and happy owners and we feel this method works best for everyone. The $200 deposit will be refundable at any time prior to confirmation of pregnancy. Once it is confirmed that our dam is pregnant the $200 becomes non-refundable, unless no pup is available upon birth. Our pups will be ready for placement at eight weeks of age. They will have current vaccinations, worming, dewclaws removed and tails docked. The remainder of the balance due must be paid in full before pick up or shipment of puppy. 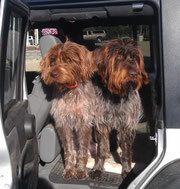 We have our dogs registered with both AKC and NAVHDA. Registration papers will be provided to the buyers upon transfer of puppy. All our puppies will have limited registrations; no breeding rights. Full registration with breeding rights may be given in the future at a small cost if the puppy meets certain criteria in testing. 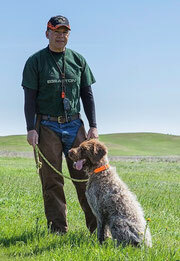 Should a puppy obtain a NAVHDA UT, or an AKC Master Hunter and a satisfactory hip rating, Full Registration with breeding rights will be given at no cost upon request. Please call for more info on this. We prefer that you pick up your puppy, but in the event that the pup must be shipped, buyers are responsible for all shipping costs. Including, but not limited to airfreight, insurance, crate and veterinary flight certificate. We are getting lots of emails and calls regarding our puppies and it's sometimes hard to keep up. Downloading and filling out the below Puppy Application and sending it to me via an email would really help. I will call you as soon as I can after reviewing your application. Note: Military personnel receive a 10% discount on our puppies. 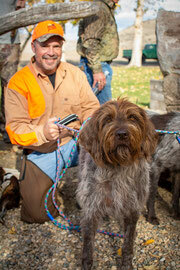 Click on Gus and Cota below to see our Facebook page The Hunting Griff, Wirehaired Pointing Griffons. See pictures of puppies, our Griffs on the hunt, training and testing.